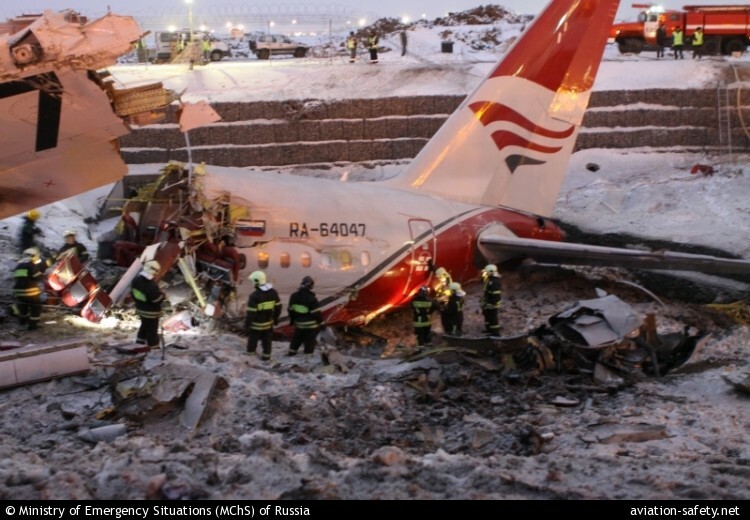 Russian investigators of the Interstate Aviation Committee (IAC) have released the final report of their investigation into a Tupolev 204 accident at Moscow’s Vnukovo Airport in Russia in December 2012, blaming misadjusted thrust reversers and the crew’s actions upon landing following an unstabilized approach. The Tupolev 204 passenger plane, RA-64047, was operated by Red Wings Airlines as a repositioning flight from Pardubice Airport (PED), Czech Republic to Moscow with a crew of eight. Flight 9268 approached from the north and was cleared for landing on runway 19. The airplane was fully configured for landing with flaps at -37°, slats at -23°, and landing gear down. Decision height was 60 metres and the planned final approach speed was 210 km/h (113 kts). The final approach was unstabilized at a speed of 255 km/h (138 kts). The airplane passed the runway threshold at a height of 15 meters (50 ft) and an airspeed of 260 km/h (140 kts). The aircraft touched down on the left hand main gear first . When the nose gear touched down, the right hand undercarriage strut had not yet compressed. Consequently, the speed brakes and spoilers did not deploy. The pilots used the brakes but they were ineffective because the pressure in the wheel brakes is only applied when both landing gear struts are compressed. The crew attempted to deploy the thrust reversers, but instead engine power and ground speed increased with the reversers failing to deploy. The airplane crossed the runway threshold at a speed of 215 km/h (116 kts). The flight engineer then shut down the engines at the request of the captain. Both landing gear struts compressed, causing the automatic release of air brakes and spoilers as well as the deployment of the thrust reversers. At that moment the jet was travelling downsloping terrain. The airplane collided with an embankment at the edge of a highway at a speed of 190 km/h (103 kts). It broke in three and the forward part of the fuselage came to rest on the highway. Five crew members were killed. Stiffness of the reverse thrust control and locking mechanism that can manifest itself only during improper reverse thrust control by the crew and that is not mentioned in the maintenance manual section covering adjustments after engine change. Contradictions between the aircraft and engine maintenance manuals and a continuous neglectful attitude to engine control system checks and adjustments (including the reverser control and locking mechanism) by organizations responsible for engine replacement, making it impossible for aircraft and engine developers to receive feedback and correct flaws. Unstabilized approach with significantly exceeded (up to 45 km/h) speed on finals ultimately resulting in a prolonged flare and touchdown 950 m past the designated point. Failure of spoilers and speedbrakes automatic deployment due to absence of the simultaneous both main gear Weight-On-Wheels signal caused by initial ‘soft’ left wheel touchdown (1.12g) in extreme conditions of 11.5 m/s right crosswind. Failure of flight crew to verify the automatic spoilers and speedbrakes deployment after touchdown and to deploy them manually. Flight manual violation regarding the use of reverse thrust by the crew applying maximum reverse in a ‘single input’ without setting the lever into intermediate position and failing to verify deployment of the reversers, which in turn led to forward thrust increase due to aforementioned reverse thrust control and locking mechanism flaw. Absence of the simultaneous Weight-On-Wheels signal for both main landing gear struts during the whole landing roll due to specific sensors design (no sensor failure occured; each strut load must exceed 5,5 t) and crew’s failure to extend spoilers manually that prevented reversers to deploy. Captain’s unsatisfactory crew management during the whole flight eventually resulting in unstabilized approach and during the landing roll concentration on the reverse thrust engaging leaving other systems unattended. Failure to timely implement preventive measures after the 20.12.2012 Tu-204 RA-64049 Red Wings serious incident at Tolmachevo airport. Unsatisfactory management level and insufficient safety procedures inside the Red Wings airline, as well as the assigned pilot-instructor’s neglectful attitude to the captain’s proficiency check and absence of the proper proficiency check inspection, which in turn made it impossible to determine and eliminate systematic captain’s piloting deficiencies regarding exceeding approach speed on final, as well as the reverse thrust lever inputs technique after touchdown. Assessment monitoring described in Federal Aviation Rules-128 5.7 had not been performed. Absence of the periodical training program concerning standard procedures in case of Weight-On-Wheels sensor failures resulting in failure of spoilers and speedbrakes to deploy. Existing simulators are not capable of modeling this kind of situation.